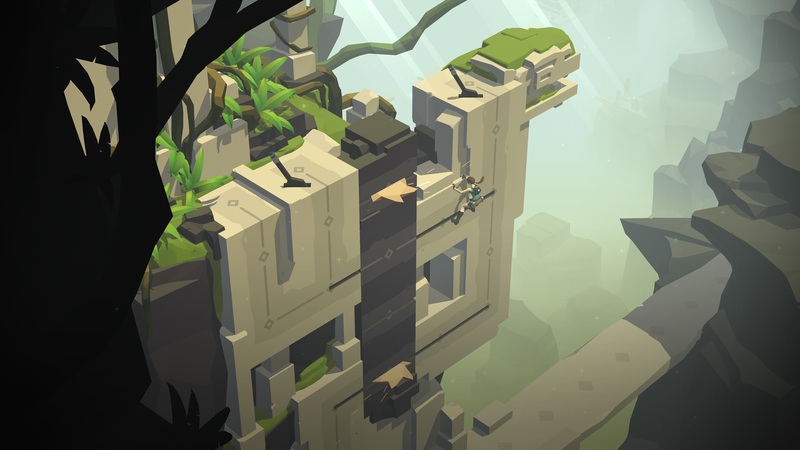 Last week, Square Enix Montreal launched Lara Croft Go on iOS and Android. Early indicators are that the game is a success; it boasts an impressive 84 Metacritic average, and shortly after launch was second on the App Store's Top Paid Apps chart, behind only Minecraft: Pocket Edition. At the moment, it seems like a worthy follow-up to last year's Hitman Go, a similar conversion of a hit Square Enix franchise into a premium, turn-based mobile game. Daniel Lutz served as director for both projects, and he recently discussed the approach he took on both games with GamesIndustry.biz. "Our approach was not just to make a port of a AAA game or a re-skin of an existing mobile game with these franchises on top, but rather build experiences from the ground up"
"I think the interesting thing for us was really to look at the big AAA franchises and build something specifically designed for these franchises," Lutz said. "Our approach was not just to make a port of a AAA game or a re-skin of an existing mobile game with these franchises on top, but rather build experiences from the ground up." For Hitman Go, that meant turning the open-ended assassination game into a turn-based puzzle game with a board game visual motif. "Hitman is kind of a thinking man's game," Lutz said. "You're orchestrating this hit in the big games where you play your enemies like pawns. It really has this board game, puppeteering thing going on so we really felt this aesthetic would go great with that." Even though players were simply sliding Agent 47 around a board one square at a time, Lutz and his team used the premise to incorporate some key Hitman game mechanics. Players had to infiltrate areas, trigger distractions to sneak past guards, and assassinate targets in a way that felt authentic to the source material, but also worked in the confines of a pick-up-and-play mobile experience. "These mechanics obviously didn't make any sense for Lara Croft," Lutz said. "So we were really looking at the classic mechanics, things that have been around in Tomb Raider games for almost 20 years now. And we looked at what are the core --almost tropes--the cool things people would expect and the cool things we really liked about these games, and how we could translate them into this game without just reusing Hitman Go mechanics." Lara Croft Go incorporates a lot of elements that will be familiar to fans of the series. Some of the answers the team came up with will be familiar to anyone with experience of the Tomb Raider franchise: pressure plate traps, pushing large objects around a level, flicking switches and moving platforms. Lara Croft is also a more proactive character than the patient Agent 47, Lutz said, so the developers needed a more dynamic art direction that made sense for her, one with fully animated models instead of Hitman Go's sculpted board game pieces. The result is a game that must stay true to multiple brands. It's helping shape the emerging Go brand, which at this point may be defined as premium mobile adaptations of Square Enix's beloved AAA brands. It's also a Tomb Raider game, with all the exploration and adventure of the long-running franchise. But it's also a Lara Croft game, Square Enix's umbrella for spin-offs of the Tomb Raider franchise, things outside the current AAA major releases that play more to nostalgia for the series' earlier days. "The market is very free-to-play oriented on mobile, so us coming out and making a premium game is a strong statement. It's something we believe in"
"I feel like Lara Croft and Tomb Radier games have a lot in common, but I see it almost like they're different takes on the same universe. You see that a lot in comic books and different franchises. It makes all the sense for Tomb Raider and Lara Croft to do something like that." It's only been a year and a half since Hitman Go launched, but even in that time Lutz has seen the mobile market change significantly. "I think it's really splitting up," he said. "On one side, you have the top-end free-to-play companies that make a huge amount of money, then you have a lot of indie developers operating on low costs that can afford to make games that are not strictly successful in financial terms, but the middle ground isn't really sustainable anymore. It's going to two extremes, the super big games and really small games... Especially when it comes to independent developers, you read a lot about them moving away from mobile now because it's just become so incredibly competitive, there are so many games coming out that it's just extremely difficult to make something financially viable." That said, Lutz acknowledged that he's been making a living of late existing in the middle ground between those extremes. "The market is very free-to-play oriented on mobile, so us coming out and making a premium game is a strong statement. It's something we believe in. There has to be a balance between following the trends and following what's going on at the moment, but also being proactive and creating our own space... I really believe in creating your own niche, creating your own spot. I think we're doing a great job of that and I would not be surprised to see more people going for that and trying to create something that is not available from other companies in the market at the moment."